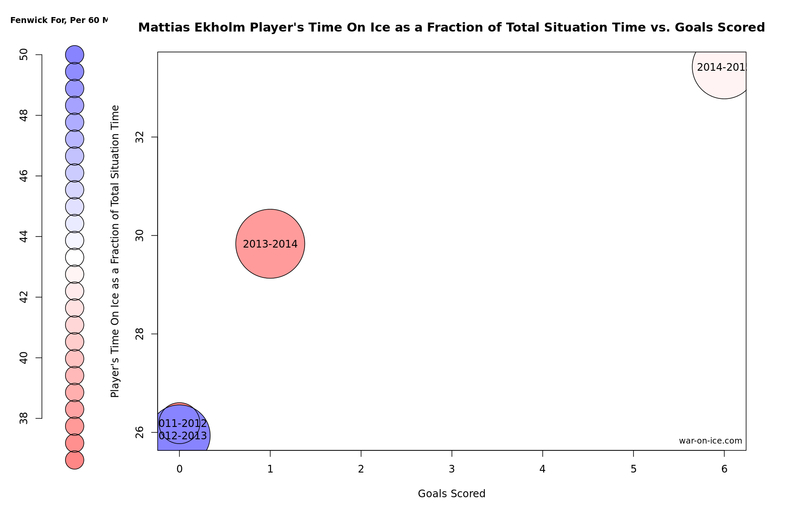 Ekholm entered Predators Training Camp in 2014 with the coming campaign standing as a “prove-it” season. The Swede had shown he deserved minutes in the NHL in 2013-14, turning in a single goal and eight helpers in 62 games of action, but questions remained about whether he could be relied on as more than a situational, offensive defenseman. Corresponding with the implementation of then-first-year Head Coach Peter Laviolette’s system, which encourages defensemen to cycle in the offensive zone and join the rush, the blueliner obliterated all of his former career best numbers in 2014-15. New career highs in goals, assists and points also resulted in Laviolette increasing Ekholm’s time on ice by an average of more than two minutes per contest (up to 19:00 TOI per game). The coming-out party for Ekholm in 2014-15 was documented by more than just the eye test, with the blueliner ranking among the NHL’s best in advanced statistics. Nashville’s second of three fourth-round selections in 2009 (forward Craig Smith was taken four picks before him) produced the League’s fifth-best SAT (282; Shot Attempts) for defenseman and was No. 1 among Nashville’s blueliners last season according to NHL.com. In short, Ekholm’s contributions help to heavily tilt play in Nashville’s favor with the Predators five-man unit outshooting the opposition by a wide margin when the Swede is on the ice. With Laviolette’s method of attack demanding high shot attempt totals from forwards and defensemen alike, a blueliner like Ekholm who can deliver results on both sides of the puck is extremely important. An uptick in Ekholm’s production last season also helped produce record-setting numbers for defensive partner Ryan Ellis and caused the pairing to emerge as one of the League’s best. Ekholm’s six-year deal and Ellis’ five-year contract inked last season means the pairing can continue to gel and develop until at least 2019. With both d-men possessing offensive firepower, quick first passes out of their own end and natural chemistry, if this pairing continues to develop - as it already has this season - watch out. Prior to the 2015-16 season, USA Today ranked the Predators defense as the NHL’s best. “Check off every box when it comes to this defense. They can defend, play a rugged style, but also move the puck well and provide offense... You could conceivably fit five of them in a top-pair role,” wrote Jimmy Hascup earlier this month. Following Ekholm’s new deal, four of those five “top-pair” defensemen are set to skate in Predators Gold for many years to come with Roman Josi, Shea Weber and Ellis all signed through at least the 2018-19 season. Add in Seth Jones, a restricted free agent after the 2015-16 campaign, likely signing a contract extension as well and that number swells to five-for-five long-term blueliners in Nashville. Don’t forget that Ekholm, Ellis, Josi and Jones are all under the age of 26 and are yet to enter the prime of their careers. It’s safe to say media outlets will be making space for the Preds d-corps in their Top Five rankings for the foreseeable future.